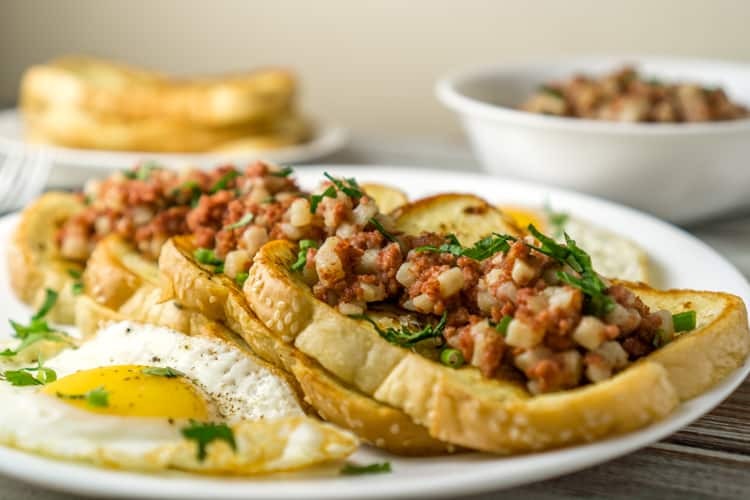 This recipe for Savory Fresh Toast with Corned Beef Hash has been compensated by Collective Bias, Inc. and its advertiser. A slow paced weekend breakfast is one of the things I look forward to the most during the week. We usually try to arrange our weekends so that one of the days is free from errands, chores, and events – to have one day just for us. And on those days we sleep in, make breakfast together, enjoy our lazy mornings, and spend time with the kitty cats. On days like these we like to treat ourselves to a special breakfast. And special does not mean fussy, it just means it is something much more exciting than instant oatmeal or scrambled eggs. Lately I’ve been working on a Savory French Toast recipe, and it is starting to be come one of my favorite Sunday breakfasts. It is so easy to make and it is super delicious. And best of all, it is very versatile – serve it with bacon, a fried egg, or corned beef hash. It is the perfect flavorful and convenient addition to a hearty breakfast that I don’t have everyday. 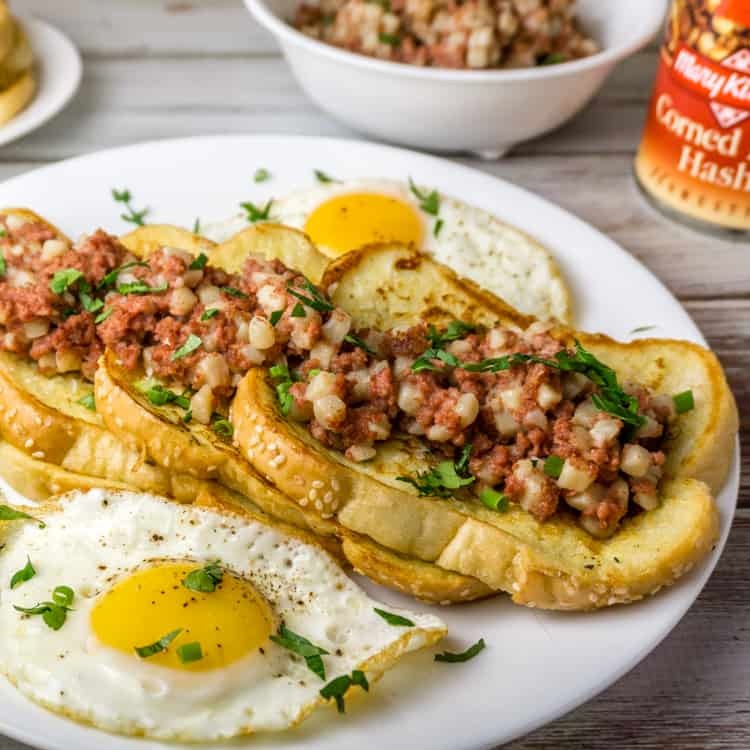 I’ve mentioned before that I am more of a savory kind of person instead of a sweet person, so this breakfast combination is right up my alley: perfect Savory French Toast – browned on the outside and creamy on the inside – topped with yummy Parmesan cheese, a gooey runny egg, and crispy browned HORMEL® MARY KITCHEN® Corned Beef Hash. It is the ultimate combination for breakfast. 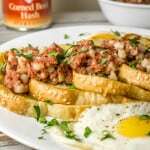 A twist on the classic breakfast French Toast - this easy and delicious Savory French Toast recipe will quickly become your family's favorite! In a large bowl, whisk together the eggs, milk, thyme, salt, garlic powder, nutmeg, and black pepper. Preheat a large skillet over medium heat and add 1/2 - 1 tablespoon of vegetable oil, spreading it evenly around the pan. Dip both sides of the bread slices into the egg mixture, shake off the excess, then place the bread in the skillet. Cook 2-3 minutes per side over medium-low heat, or until the bread is golden brown on each side. Remove from heat and repeat with remaining bread slices. While the French toast is cooking, heat a large skillet sprayed with non-stick spray. 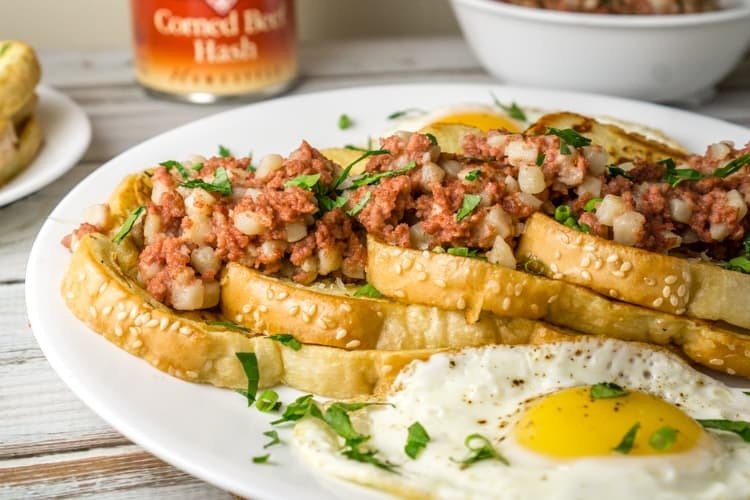 Add the Corned Beef Hash and cook stirring occasionally for 5 minutes, or until the corned beef hash is heated through and browned. 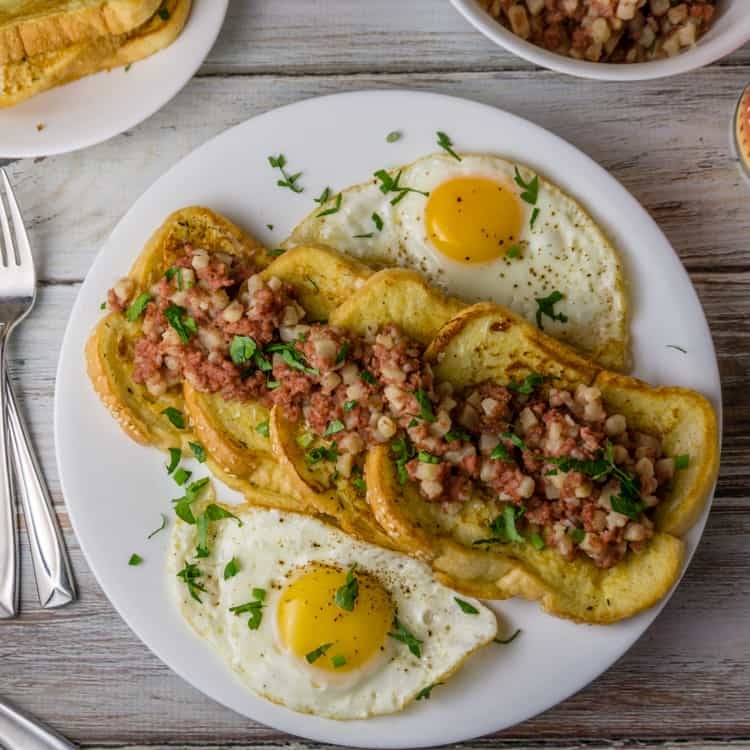 Serve the Savory French Toast with browned corned beef hash and a side of fried eggs and/or bacon. Top with freshly shredded Parmesan cheese. Thank you for the yummy idea dear Kate!